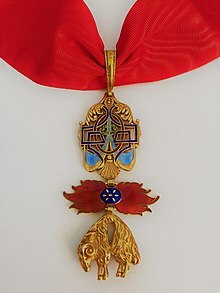 For a modern Georgian award, see Order of the Golden Fleece (Georgia). The Distinguished Order of the Golden Fleece (Spanish: Insigne Orden del Toisón de Oro, German: Berühmt Orden vom Goldenen Vlies) is a Roman Catholic order of chivalry founded in Bruges by the Burgundian duke Philip the Good in 1430, to celebrate his marriage to the Princess Isabella of Portugal. Today, two branches of the Order exist, namely the Spanish and the Austrian Fleece; the current grand masters are Felipe VI, King of Spain, and Karl von Habsburg, grandson of Emperor Charles I of Austria, respectively. The chaplain of the Austrian branch is Cardinal Graf von Schönborn, Archbishop of Vienna. Having had only 1,200 recipients ever since its establishment, the Spanish Order of the Golden Fleece has been referred to as the most prestigious and exclusive order of chivalry in the world, both historically and contemporaneously. Unlike any other distinction, the Golden Fleece is only granted for life, meaning it must be returned to the Spanish Monarch whenever the recipient deceases. Each collar is fully coated in gold, and is estimated to be worth around $60,000 USD, making it the most expensive chivalrous order. 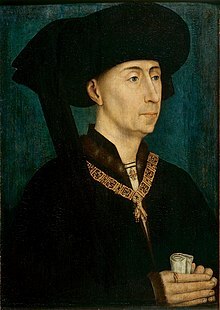 The Order of the Golden Fleece was established on 10 January 1430, by Philip the Good, Duke of Burgundy, in celebration of the prosperous and wealthy domains united in his person that ran from Flanders to Switzerland. The jester and dwarf Madame d'Or performed at the creation of the Order of the Golden Fleece in Bruges. It is restricted to a limited number of knights, initially 24 but increased to 30 in 1433, and 50 in 1516, plus the sovereign. The Order's first King of Arms was Jean Le Fèvre de Saint-Remy. It received further privileges unusual to any order of knighthood: the sovereign undertook to consult the order before going to war; all disputes between the knights were to be settled by the order; at each chapter the deeds of each knight were held in review, and punishments and admonitions were dealt out to offenders, and to this the sovereign was expressly subject; the knights could claim as of right to be tried by their fellows on charges of rebellion, heresy and treason, and Charles V conferred on the order exclusive jurisdiction over all crimes committed by the knights; the arrest of the offender had to be by warrant signed by at least six knights, and during the process of charge and trial he remained not in prison but in the gentle custody of his fellow knights. The order, conceived in an ecclesiastical spirit in which mass and obsequies were prominent and the knights were seated in choirstalls like canons, was explicitly denied to heretics, and so became an exclusively Catholic honour during the Reformation. The officers of the order were the chancellor, the treasurer, the registrar, and the King of Arms, or herald, Toison d'Or. The Duke's stated reason for founding this institution had been given in a proclamation issued following his marriage, in which he wrote that he had done so "for the reverence of God and the maintenance of our Christian Faith, and to honor and exalt the noble order of knighthood, and also ...to do honor to old knights; ...so that those who are at present still capable and strong of body and do each day the deeds pertaining to chivalry shall have cause to continue from good to better; and .. so that those knights and gentlemen who shall see worn the order ... should honor those who wear it, and be encouraged to employ themselves in noble deeds...". The choice of the Golden Fleece of Colchis as the symbol of a Christian order caused some controversy, not so much because of its pagan context, which could be incorporated in chivalric ideals, as in the Nine Worthies, but because the feats of Jason, familiar to all, were not without causes of reproach, expressed in anti-Burgundian terms by Alain Chartier in his Ballade de Fougères referring to Jason as "Who, to carry off the fleece of Colchis, was willing to commit perjury." The bishop of Châlons, chancellor of the Order, rescued the fleece's reputation by identifying it instead with the fleece of Gideon that received the dew of Heaven. The badge of the Order, in the form of a sheepskin, was suspended from a jewelled collar of firesteels in the shape of the letter B, for Burgundy, linked by flints; with the motto "Pretium Laborum Non Vile" ("No Mean Reward for Labours") engraved on the front of the central link, and Philip's motto "Non Aliud" ("I will have no other") on the back (non-royal knights of the Golden Fleece were forbidden to belong to any other order of knighthood). With the absorption of the Burgundian lands into the Spanish Habsburg empire, the sovereignty of the Order passed to the Habsburg kings of Spain, where it remained until the death of the last of the Spanish Habsburgs, Charles II, in 1700. He was succeeded as king by Philip V, a Bourbon. 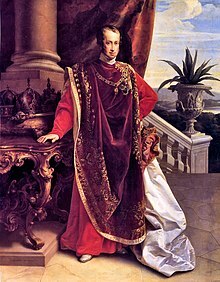 The dispute between Philip and the Habsburg pretender to the Spanish throne, the Archduke Charles, led to the War of the Spanish Succession, and also resulted in the division of the Order into Spanish and Austrian branches. In either case the sovereign, as Duke of Burgundy, writes the letter of appointment in French. The controversial conferral of the Fleece on Napoleon and his brother Joseph, while Spain was occupied by French troops, angered the exiled King of France, Louis XVIII, and caused him to return his collar in protest. These, and other awards by Joseph, were revoked by King Ferdinand on the restoration of Bourbon rule in 1813. Napoleon created by Order of 15 August 1809 the Order of the Three Golden Fleeces, in view of his sovereignty over Austria, Spain and Burgundy. This was opposed by Joseph I of Spain and appointments to the new order were never made. In 1812, the acting government of Spain conferred the Fleece upon the Duke of Wellington, an act confirmed by Ferdinand on his resumption of power, with the approval of Pope Pius VII. Wellington therefore became the first Protestant to be honoured with the Golden Fleece. It has subsequently also been conferred upon non-Christians, such as Bhumibol Adulyadej, King of Thailand. There was another crisis in 1833 when Isabella II became Queen of Spain in defiance of Salic Law that did not allow women to become heads of state. Her right to confer the Fleece was challenged by Spanish Carlists. Sovereignty remained with the head of the Spanish house of Bourbon during the republican (1931–39) and Francoist (1939–1975) periods and is held today by the present King of Spain, Felipe VI. Knights of the Order are entitled to be addressed with the style His/Her Excellency in front of their name. King Felipe VI of Spain (1981) – As reigning King of Spain, Sovereign of the Order since 2014 after his father abdicated his rights to him. King Juan Carlos I of Spain (1941) – Former Sovereign of the Order as King of Spain from 1975 to 2014. The Austrian Order did not suffer from the political difficulties of the Spanish, remaining (with the exception of the British prince Regent, later George IV) an honour solely for Catholic royalty and nobility. The problem of female inheritance was avoided on the accession of Maria Theresa in 1740 as sovereignty of the Order passed not to herself but to her husband, Francis. 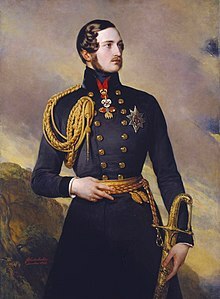 Upon the collapse of the Austrian monarchy after the First World War, King Albert I of Belgium requested that the sovereignty and treasure of the Order be transferred to him as the ruler of the former Habsburg lands of Burgundy. This claim was seriously considered by the victorious allies at Versailles but was eventually rejected due to the intervention of King Alfonso XIII of Spain, who took possession of the property of the Order on behalf of the dethroned emperor, Charles I of Austria. 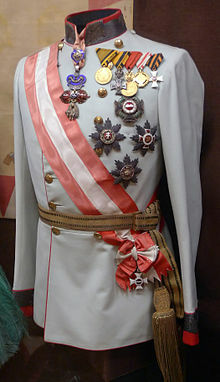 Sovereignty remains with the head of the House of Habsburg, which was handed over on 20 November 2000 by Otto von Habsburg to his elder son, Karl von Habsburg. Weatherly, Cecil (1911). "Knighthood and Chivalry" . In Chisholm, Hugh. Encyclopædia Britannica. 15 (11th ed.). Cambridge University Press. pp. 851–867. ^ D'Arcy Jonathan Dacre Boulton (2000) [February 1987]. The knights of the crown: the monarchical orders of knighthood in later medieval Europe. Woodbridge, Suffolk: Boydell Press, Palgrave Macmillan. ISBN 0-312-45842-8. ^ "Bandera, María: ¿Qué es el Toisón de Oro y quiénes lo han merecido?". COPE. ^ Gibbons, Rachel (18 January 2013). Exploring history 1400-1900: An anthology of primary sources. Manchester University Press. p. 65. ISBN 9781847792587. Retrieved 30 July 2018. ^ The Anglo American. 1844. p. 610. ^ "Origins of the Golden Fleece". Antiquesatoz.com. September 8, 1953. Retrieved May 3, 2012. ^ Buchon, Jean Alexandre (1838). Choix de chroniques et mémoires sur l'histoire de France: avec notices [Selection of chronicles and memoirs on the history of France: with notices] (in French). 2. Paris: Auguste Desrez. pp. xj-xvj (11–16). ^ Johan Huizinga, The Waning of the Middle Ages (1919) 1924:75. ^ Johan Huizinga, The Waning of the Middle Ages  1924:75). ^ "qui pour emportrer la toison De Colcos se veult parjurer." ^ "Search object details". British Museum. February 22, 1994. Retrieved May 3, 2012. ^ "iafrica.com | news | world news | Sarkozy to get Golden Fleece". News.iafrica.com. November 25, 2011. Retrieved May 3, 2012. ^ "Schatz des Ordens vom Goldenen Vlies". Die Wiener Schatzkammer. Retrieved September 11, 2016. ^ a b c d e f g h i j k l m n o p q r s t u v w x y z aa ab "Chevaliers de la Toison d'Or, Toison Autrichienne". Retrieved September 11, 2016. ^ Genealogisches Handbuch des Adels, Fürstliche Häuser XVIII (Limburg an der Lahn: C.A. Starke, 2007), 4. ^ Genealogisches Handbuch des Adels, Fürstliche Häuser XIV (Limburg an der Lahn: C.A. Starke, 1991), 111. ^ Genealogisches Handbuch des Adels, Fürstliche Häuser XIV (Limburg an der Lahn: C.A. Starke, 1991), 113. ^ Genealogisches Handbuch des Adels, Fürstliche Häuser XIV (Limburg an der Lahn: C.A. Starke, 1991), 95. ^ Genealogisches Handbuch des Adels, Fürstliche Häuser XIV (Limburg an der Lahn: C.A. Starke, 1991), 119. ^ Genealogisches Handbuch des Adels, Fürstliche Häuser XIV (Limburg an der Lahn: C.A. Starke, 1991), 112. ^ Genealogisches Handbuch des Adels, Fürstliche Häuser XIV (Limburg an der Lahn: C.A. Starke, 1991), 94. ^ Genealogisches Handbuch des Adels, Fürstliche Häuser XVIII (Limburg an der Lahn: C.A. Starke, 2007), 80. ^ Genealogisches Handbuch des Adels, Fürstliche Häuser XV (Limburg an der Lahn: C.A. Starke, 1997), 605. ^ Genealogisches Handbuch des Adels, Fürstliche Häuser XVIII (Limburg an der Lahn: C.A. Starke, 2007), 122. ^ Genealogisches Handbuch des Adels, Fürstliche Häuser XVIII (Limburg an der Lahn: C.A. Starke, 2007), 50. ^ Genealogisches Handbuch des Adels, Fürstliche Häuser XVI (Limburg an der Lahn: C.A. Starke, 2001), 564. ^ Genealogisches Handbuch des Adels, Fürstliche Häuser XIV (Limburg an der Lahn: C.A. Starke, 1991), 122. ^ Genealogisches Handbuch des Adels, Fürstliche Häuser XIX (Limburg an der Lahn: C.A. Starke, 2011), 279. ^ Genealogisches Handbuch des Adels, Fürstliche Häuser XV (Limburg an der Lahn: C.A. Starke, 1997), 602. ^ Genealogisches Handbuch des Adels, Fürstliche Häuser XV (Limburg an der Lahn: C.A. Starke, 1997), 424. ^ Genealogisches Handbuch des Adels, Fürstliche Häuser XIX (Limburg an der Lahn: C.A. Starke, 2011), 271. ^ Genealogisches Handbuch des Adels, Fürstliche Häuser XIX (Limburg an der Lahn: C.A. Starke, 2011), 436. ^ "The Habsburg Most Illustrious Order of the Golden Fleece: Its Potential Relevance on Modern Culture in the European Union"
Wikimedia Commons has media related to Order of the Golden Fleece.